Thanks to the high temperature resistance of glass coated cloth, it is now possible to manufacture Weld Purging Systems to resist temperatures up to 760º C.
This is particularly valuable for welding pipework suitable for power stations and other utilities that produce high pressure steam for the rotation of turbines to produce electricity for the national grid. Usually the materials specified for such pipework are chrome steels that need to be heated up to 300º C prior to and during welding and 760º C for heat treating/annealing (for stress relief purposes) afterwards. For a number of technical reasons, the inside of the welds made to join the pipework have to be covered in an inert gas to prevent oxidation and metallurgical defects. In order to provide the conditions for welding the joints described, a weld purging system is generally used to isolate a small volume either side of the weld, to create optimum conditions. A pipe purging system will reduce the volume to be purged quite dramatically and in such large diameter power pipework the amount of Argon gas saved could be sufficient to pay for the costs of such purging systems in just one weld. In addition, a professionally designed and manufactured system will ensure that the leaks found in lower quality products, can cause no oxidation or sugaring to the weld joints. Huntingdon Fusion Techniques, HFT® now manufactures their very successful Argweld® Quick Purge Systems with glass treated silicone cloth. High-strength steel joints must pre-heated prior to welding and also require a post-weld heat treatment. Weld joints of this nature are often purged of oxygen and welded in an inert atmosphere to reduce the risk of ‘sugaring’, an imperfection that could allow metal pieces to break off inside pipework and cause damage to turbines. With the high temperatures and length of time at such temperatures, most weld purging systems are unsuitable. HotPurge® has been developed by International Weld Purging Specialists Huntingdon Fusion Techniques HFT®, as an Inflatable Pipe Purging System for Heat Treated Chrome and High Strength Stainless Steel Pipe Joints where the temperatures might be as high as 760º C (1,400º F) for many hours. 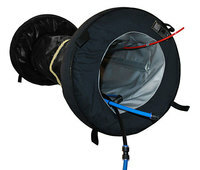 HotPurge® includes PurgeGate®, a revolutionary device to prevent over inflation of, and damage to the inflatable dams. No matter how high the user increases the pressure, in order to deliver more gas flow, PurgeGate® prevents too much pressure being delivered to the inflatable dams, allowing an increased flow, to achieve a lower oxygen level or faster cooling of the weld zone. Additionally, HotPurge® ensures the purge space remains tightly sealed at all times as the inflatable dams maintain an even seal throughout the weld cycle, irrespective of pressure rises or excessive flow rates of argon gas. The large central collar dramatically reduces the space to be purged and makes it easier to reach lower oxygen levels faster than with conventional purging systems. Furthermore, each HotPurge® System incorporates an innovative central band for easy positioning inside the pipe. This band, known as RootGlo®, will illuminate inside the dark pipe, for up to 20 hours, with only 10 minutes previous exposure to daylight. They are manufactured to suit pipe diameters from 6 to 88 inches (152 to 2,235 mm) and both inflatable dams have pull handles securely sewn with high temperature resistant Kevlar thread that will withstand a pulling force of 1,000 lb. These Inflatable Pipe Purging Systems can be used repeatedly for weld purging and will keep the oxygen levels well below 100 parts per million (ppm) throughout the welding cycle, ensuring oxide and coke free welds, without the metallurgical imperfections caused by exposure to too much oxygen.